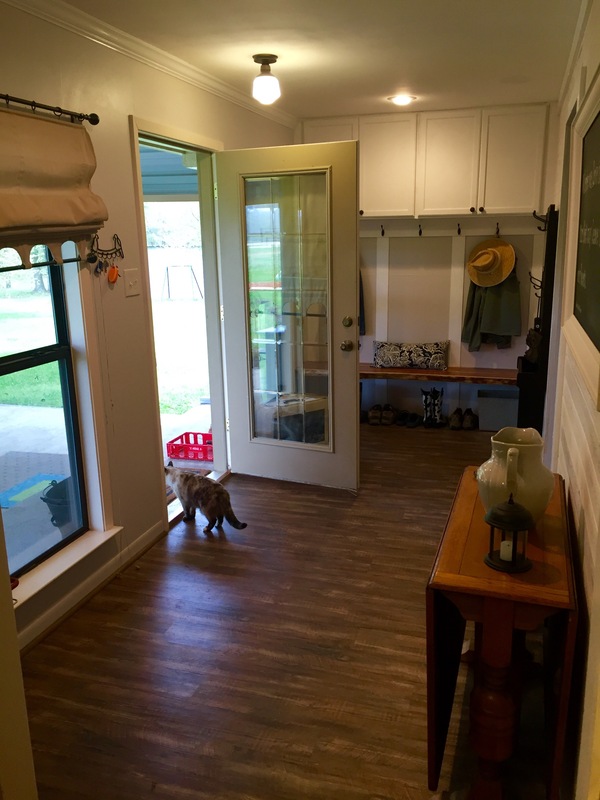 Well, after 6 months, we have 99% completed our mudroom. We started with one large room that at one time was a two car garage. The room was great, but in a home that is on a dirt road, in the country on 15 acres, in an area that gets a lot of rain, with muddy shoes, and a large dog (get the picture?) I needed a place for messy stuff to stop before making it all the way into our main living area. The photo above shows the room without the wall and the previous owner’s stuff inside. Before we even started, we installed vinyl plank flooring. I still love it and do not regret the decision. We also added recessed lighting and a cute little schoolhouse light above the door. The first step was adding a wall to define the space. 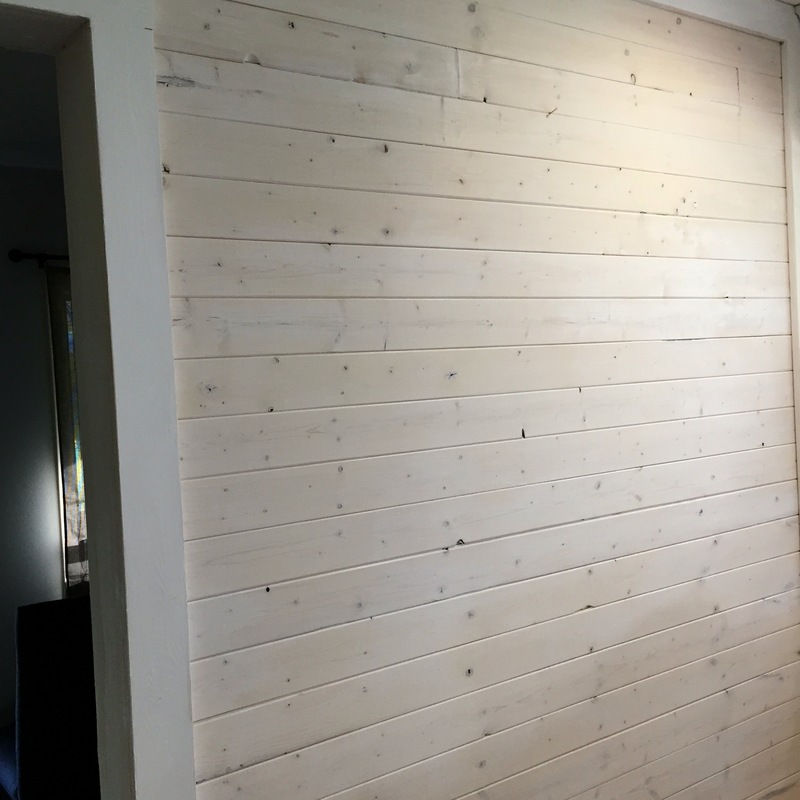 I am crazy about our tounge and groove pine walls that are whitewashed. 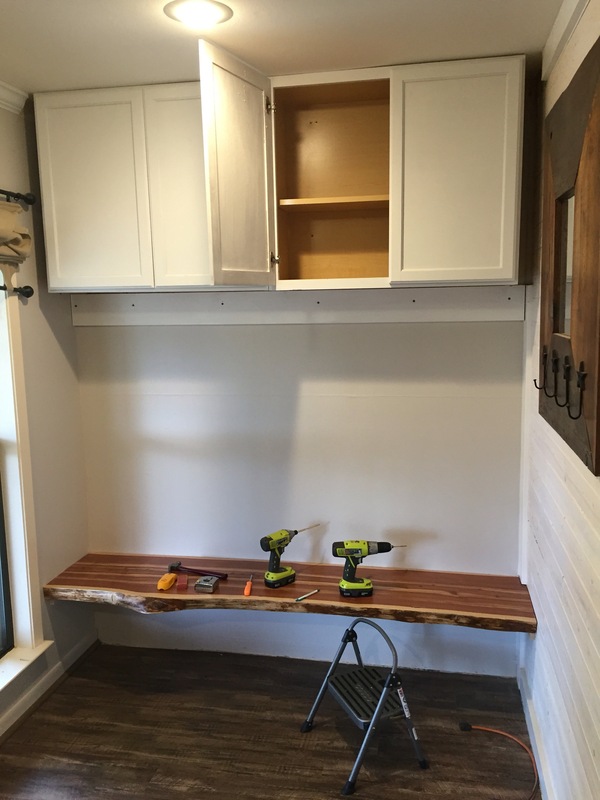 The next step was to add a bench. 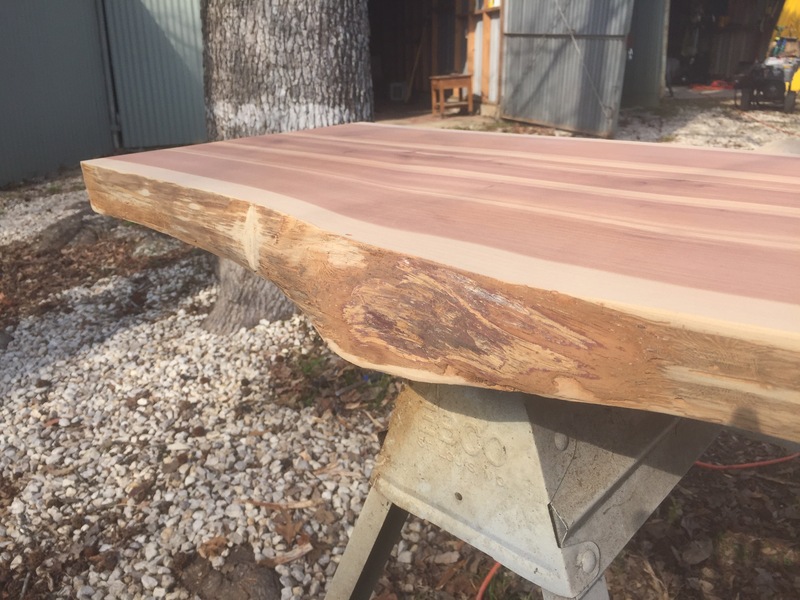 We hit the jackpot when my dad gave us a 2 inch slab of live edge cedar that is almost 18 inches wide and 90 inches long. It was the perfect bench seat. It is installed into the studs with cleats underneath. I cannot stop staring at it every time I walk in. We need storage in this home. Desperately. So instead of cute open storage that I could fill with accessories, it was closed 30 inch stock cabinets painted white that are filled with bbq equipment, marshmallow roasting devices, tools, light bulbs and other not cute items. Our thought was that we would put things we keep inside but use outside in the space. The knobs are plain Jane and functional, but I like them. 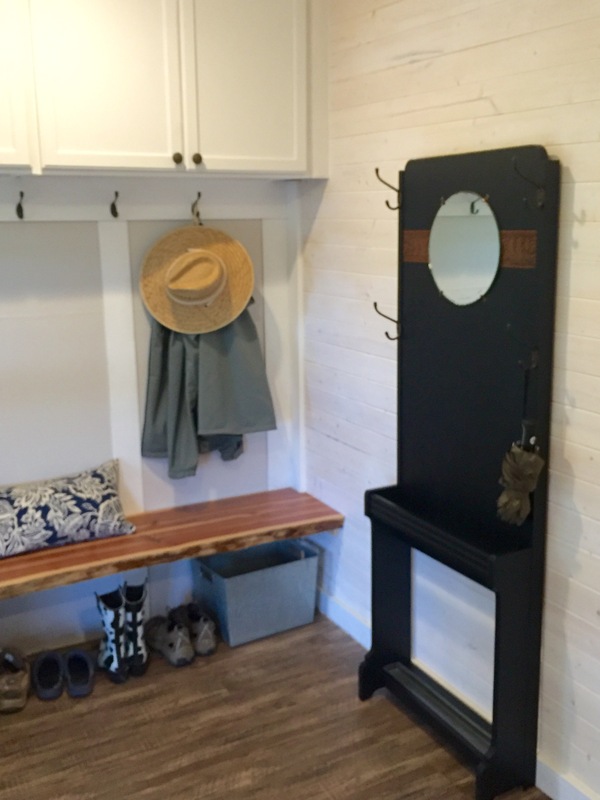 We also added board and batten walls with a tall ledger board for coat hooks. I bought a multipack of hooks at Lowe’s for the space. 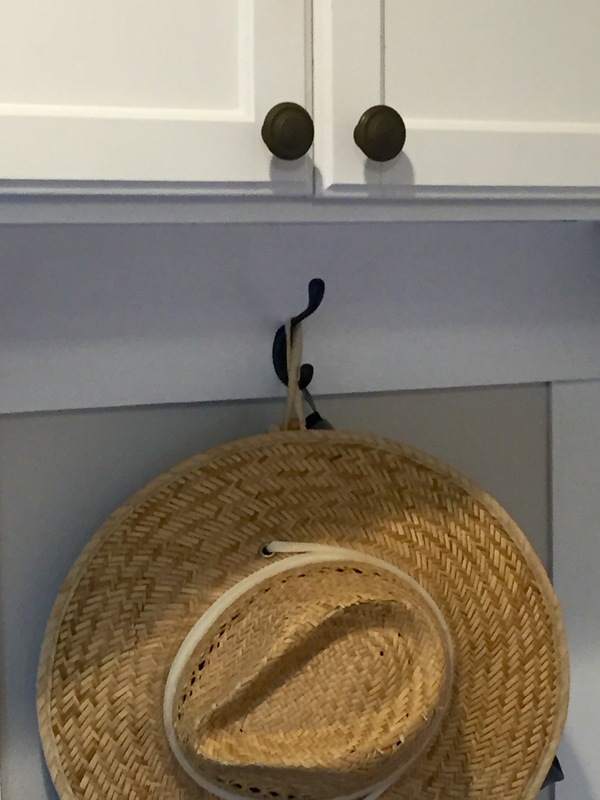 I like how rounded they are in case one of the giant men who come in our house should connect their head with a hook. 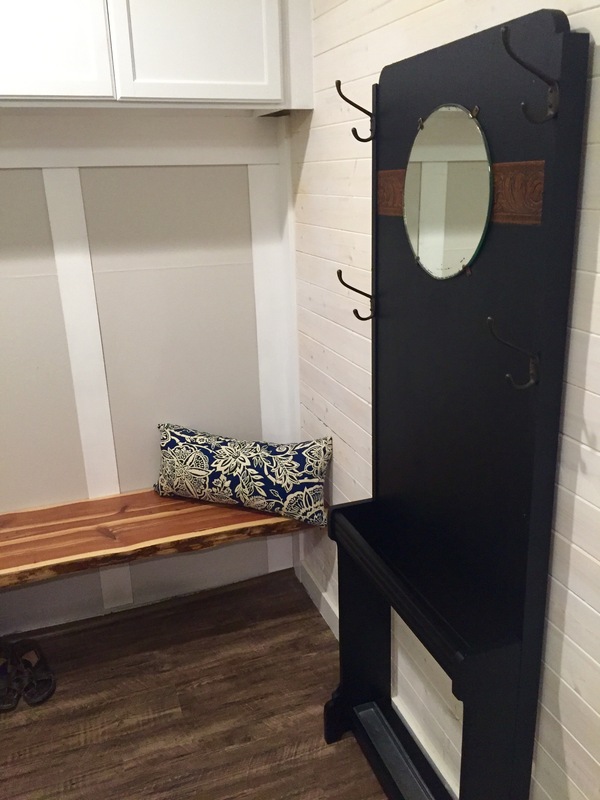 Because there was a large open wall space and I hadn’t come up with a plan for a mirror or umbrella storage, we moved a very narrow hall tree that was a gift from my buddy, The Social Planner. It has a place for umbrellas at the bottom, a cool round mirror and additional hooks that will hold caps. 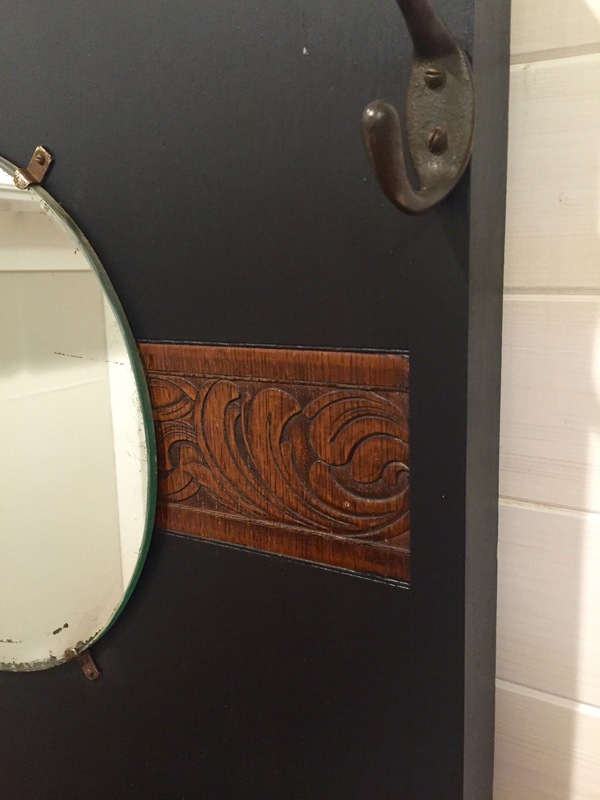 I painted all but the wood detail with chalkboard paint. 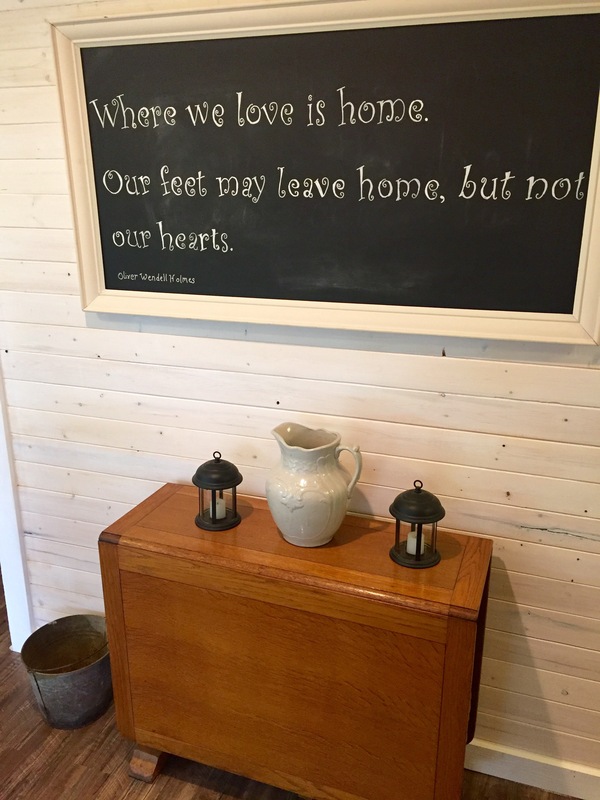 I wanted the piece to go along with the large chalkboard on the other side of the door and the oak table. Don’t hate me for painting wood. 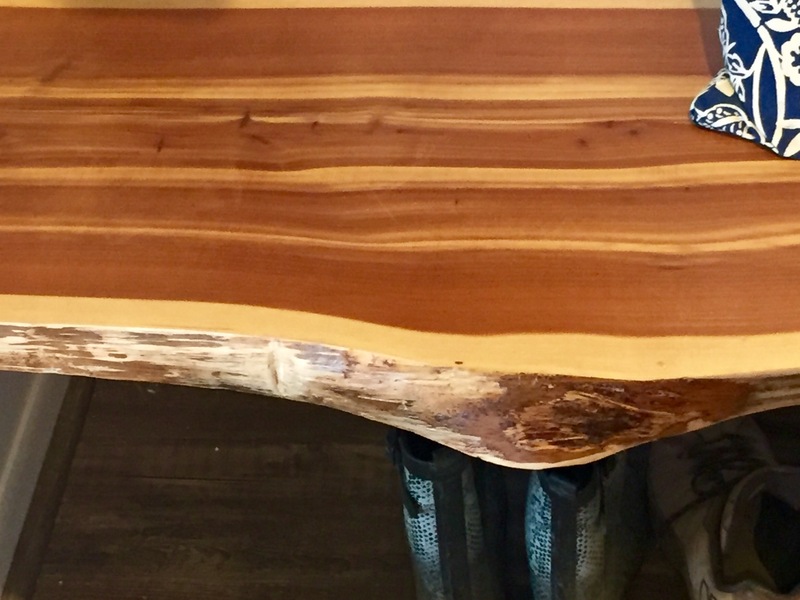 I like a mix of wood and color. It was in rough shape at the bottom after years of mopping around it, and the metal umbrella holder needed to have the dents fixed. It will proudly serve us well for years to come. 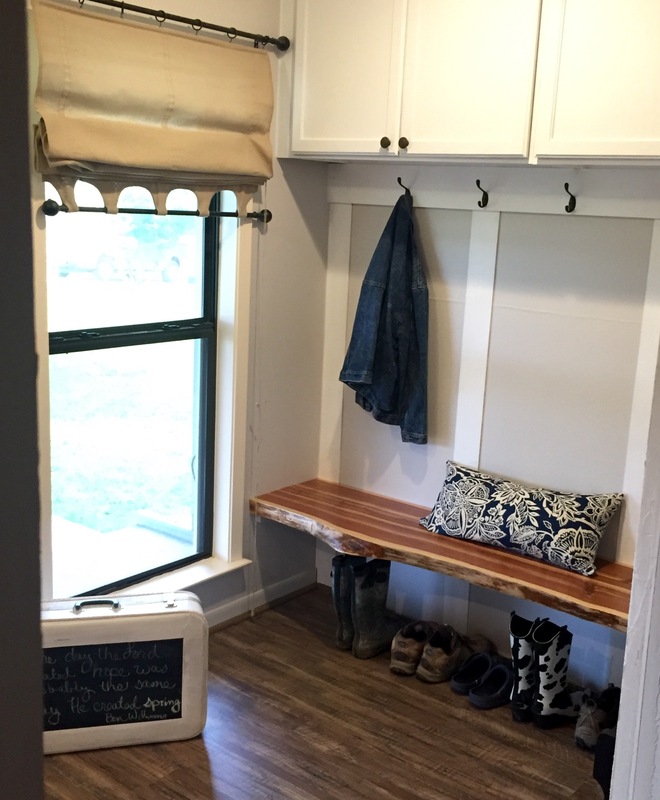 The other side of the mudroom connects with our laundry room. 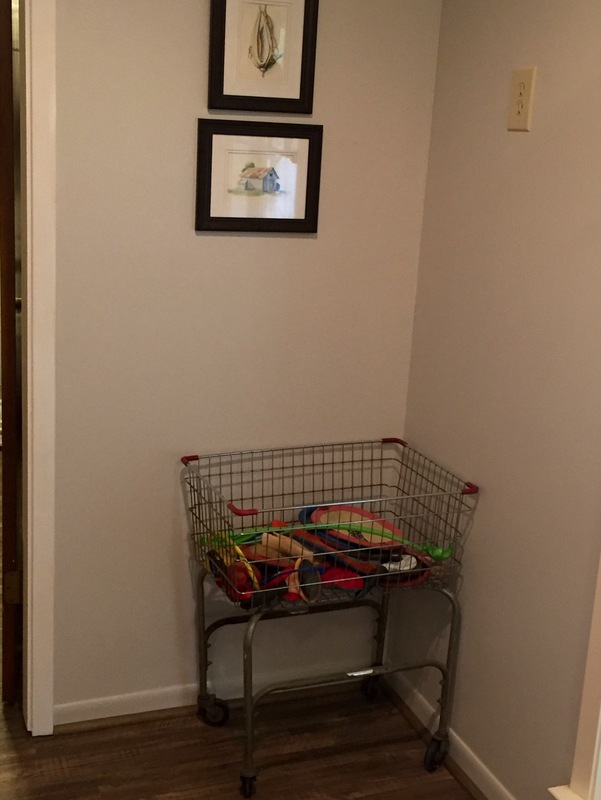 We plan on adding a broom closet in the corner that currently holds all the dog toys. ( Just keeping it real, folks.) 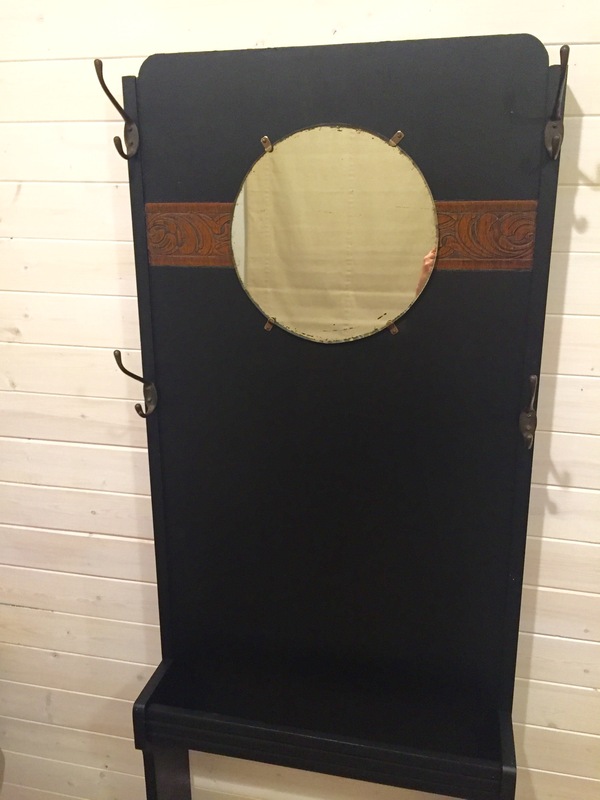 It will have a cool screen door when it is my closet! We are also planning to add a pocket door to the laundry room so that the current 36 inch door is out of the way. 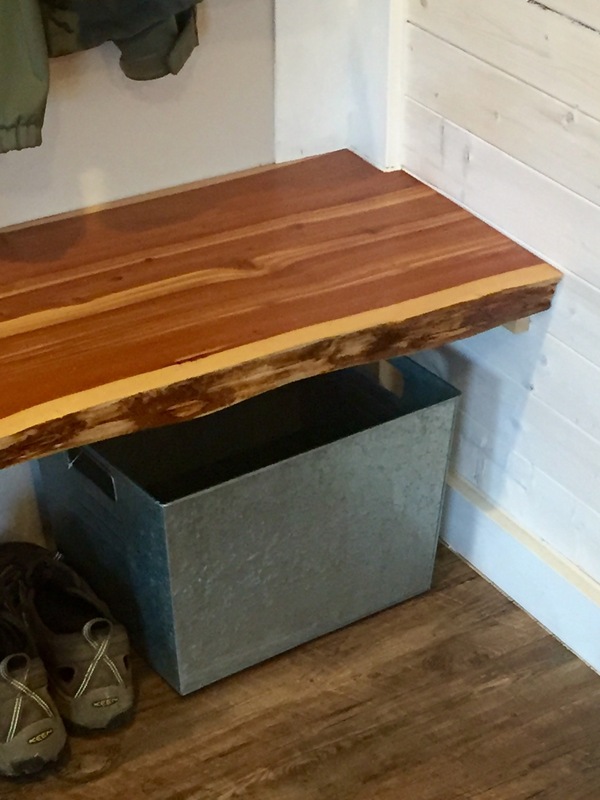 As soon as the suburban home sells I will be moving the galvanized tubs from the laundry room under the bench. I did bring one so I could make sure it will work. It does. I will be adding felt bumpers to the bottom of the tubs to protect the floors. I am calling this room done enough that it doesn’t bug me and can move on to other projects once the ceiling is done. 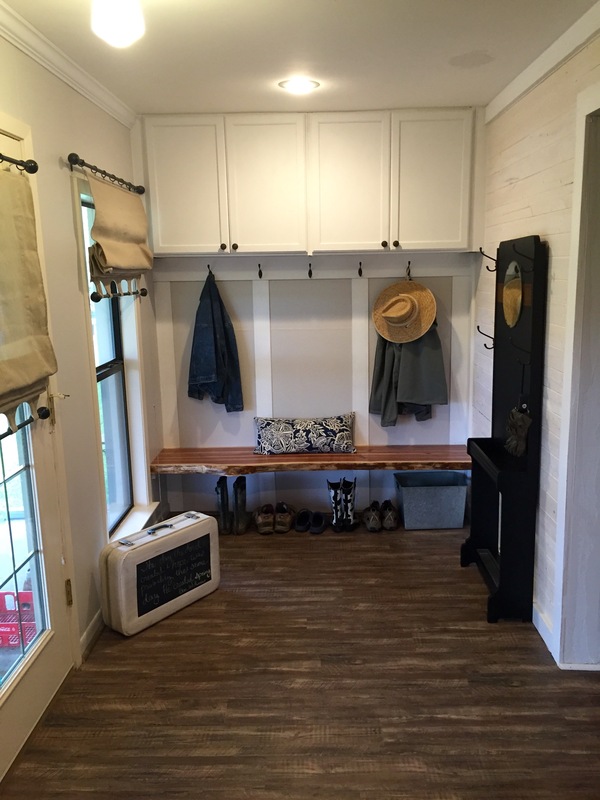 Our next step is to get the barn door in between the mudroom and dining area and enlarge our master closet. Slow and steady progress. Thank you all for following along on our journey.